and talking of hobbycraft i did take myself out yesterday for a little drive now my heads not so dooooooooh!! and just by accident found myself outside hobbycraft...how did that happen so it would have been rude not to go in...i had a good rummage and decided i needed to go upstairs..now me and stairs dont get along...especially at the moment so sassy decided to take the lift....ok finger on button constantly to get it down...sooooooo slowwwww...then got in on my own..finger again firmly on the up arrow..till i eventually reached 2nd floor BUT!!!! the sodding door wouldnt open oh hell!!! panic,,,i need a wee ..im trapped!!! !.i need HELP!!! so i had no choice to press the button with a Red Bell printed on it.....geeeeeeeees..its a wonder the firbrigade in the next City didnt hear it...didnt have to wait long.sadly not for the burly fire crew ..oh what shame..but a really sweet assistant came to my resce ..so panic over...haha it can only happen to me so stanner lifts...you did nothing for my street credit...i looked worse when i came out the darn thing than when i went in and much to my surprise when the assistant said did i need a dr....i replied no just Glue...lol!!!! !.well all ended ok and she escorted me back to ground floor when id finishe perusing as i was still paniked by what had happened....so birthday pennies spent i went home a happy girl well as happy as a poorley girl can be...so sassy hugs to you ALL !!!! for being just the bestest people mwah!!!. Og sassy what you like think you need someone to go crafty shopping can I come tee hee bank manger banned me Grrrrrrrrrr. Glad you are ok and so love this and your pin is just stunning I so love these but not sure how to make them must try one day tend to use the pearl pins and add the odd one with a touch of glue but dont think this is really right. Sorry you have lost some sleep Sassy but you put the time to good use. 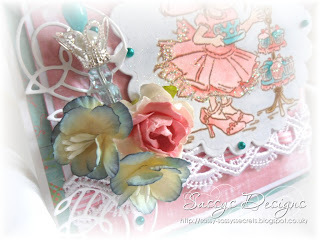 Gorgeous, feminine, pretty card. Love it. hahaha, so funny story, I laughed (sorry). Oh jeah, next time my boyfriends snores (so that will be tonight mind you) I will go get my hoover out LOL! bIf my neighbours complain I will answer that I just wanted to share a bit of the noice I have to put up with every night! Aaaaaaaaaaaaw that pretty lace you got, wish I had a lovely pal in Switzerland too LOL! No honestly, I'm so glad I found your blog and that you are such a nice person and since I'm off pretty good here, I love to share some of my stuff with nice lassies all around the world. Enjoy my gift, Sweetie and pls take care! Ha ha you do make me laugh hun but i can just imagine being stuck in a lift my hubby wont use them, i hope your feeling better soon. 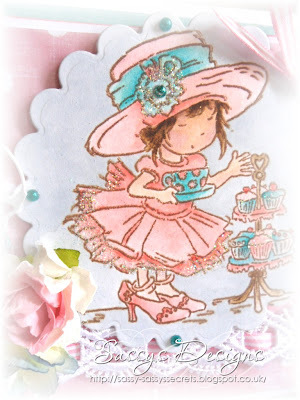 Gorgeous card Sassy, the image is sweet I like the lace and the flowers, those cakes look yummy so tea with two for me please, I hope you are over hobbycraft visit now. Hiya, oh dear, I think I would have passed out - I hate lifts! The things we do to get to some stash! Oh Sassy ... what an adventure!! Are you sure you are okay? It's terrifying when those things happen! Well your card is OUTSTANDING and I just love your choice of colors! What beautiful lace ... how sweet of your friend to pass it along to you! The little touches of sparkle are perfect! 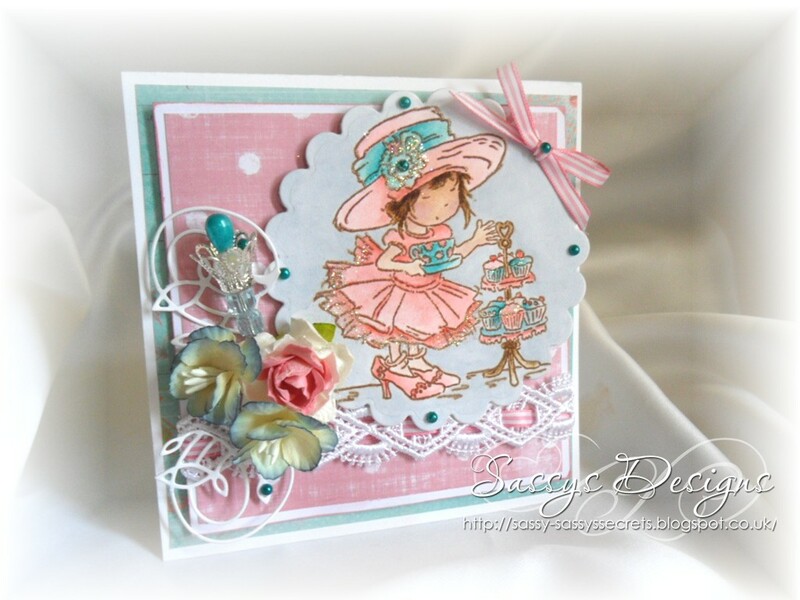 Oh I just adore your gorgeous cards my friend. Lovely work I saw you featured at the Dezinaworld blog. I'm now your newest follower. Gorgeous card. The image is lovely and coloured beautifully. Love all the fab embellishments. Great job. Hope you have recovered from your trip to Hobbycraft. I think I would have started crying Sassy - I HATE lifts!! Adore your card, it's sooooo beautiful! So sweet .....almost edible !! It's o yummy ! !